Buy Watkins Products or Start Your Watkins Home Business |Join Watkins Today! Watkins: Buy & Sell Watkins Products| Start a Watkins Home Business | Join Now! Start a Watkins Home Business: APRIL SPECIAL - ONLY $19.95! Want to start your own home business? Flexible, no auto-shipments. Work when you want, how you want, where you want! *Important - This site works best on a desktop. If you are using a mobile device & signing up, please note you must complete all 4 Steps to activate your Watkins membership. Step 4 is the payment process. If you don't have a desktop you can call me at 403.998.8597 and I can help you sign up on my end. If there is no answer, please leave a message and I'll get back to you as soon as I can! Fire up the BBQ - April Sales are HOT - HOT - HOT! Spring is here and warm weather on the way! Let's get things cooking and bring the living to the outdoors! Hello BBQ and hello yummy recipes! Just introduced, these organic spices are totally amazing! Totally re-designed and coming in a glass jar to preserve freshness and quality, Watkins has really upped the game and delivered on these gourmet spices! Mixed together in the perfect blend, you can use the blends in so many ways. On steaks, seafood, pork, in salads, dips, spreads...I'm sure you will find some more ways as they are super delicious and little goes a long way! Better yet - why not get these products while they are on sale?! A great time to stock up and at a great price too! You can visit the website to see these products and more on sale this month! Ordering is easy and you get free Shipping and Handling for orders of $100 or more. Don't have $100 worth of products you want, that's ok - why not see if any friends or family needs anything! You can group the whole order together and get free Shipping and Handling and delivered right to your door! (Canada and USA). Just want to see what's on sale and put in a personal order for now? Sounds great! Visit the Watkins website here, click the flag of the country you belong to and browse away! Add items to your cart, checkout and have the items delivered easily to your door! 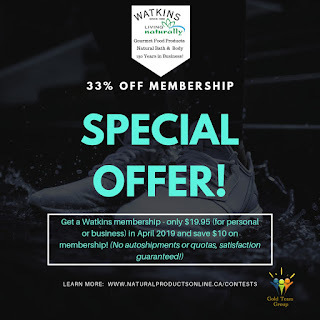 Save $10 on Watkins Membership - Only $19.95 April 2019! If you have been wanting to join Watkins and start a Watkins home business NOW is the time! You will get an instant $10 off the regular membership price when you join up in April 2019! The membership is now only $19.95 - what a DEAL! NO Autoshipments, NO Quotas - FREE S&H offers, special deals for consultants and first access to new products - you can order for yourself, family & friends and even run this as a business for extra income! The choice is yours and no one on my team will EVER pressure you to do 'sales'. Run this on your own time and know it's totally flexible and no pressure! Are you looking to make some extra income? Perhaps you want to supplement your current income or would like to change your F/T job to something else? Maybe you are retired and looking for something to do and get involved in? Whatever your reasons, a Watkins business is a great fit for many people. Now, these are just my personal reasons, but in over 12 years running my own business I can say with confidence this is a great business to have! Work online, offline, do parties, markets, direct selling - it's up to you! I'm sure there are more reasons but you get the idea! This business is full of perks and I can say with 100% honesty that it's a business you can work with and have help you with your retirement too! I'll also honestly say you get what you put into it. There is no get rich quick business that works out there and if you want to put in minimal effort and get rich, then this is not the business for you. I've been at this business for over a decade now. I work F/T and am always learning new skills. I manage a team and work to help them reach their goals. When I say I work F/T I don't mean 40 hours a week. I just mean I dedicate most of my available time to this business. I take lots of holiday time during the year, I have time for my family and do volunteer work for our local Hospice. This business allows me the type of life I want and provides me financial stability at the same time. Ready for this? Best Contest EVER! 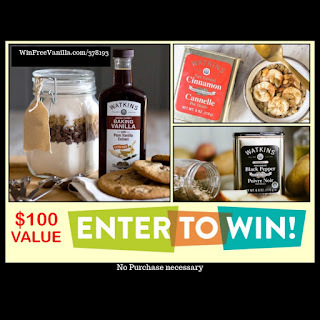 You can win free Watkins vanilla plus additional food products! Up to $150 worth! Enter the Win Free Vanilla contest here and good luck! Last year we introduced a new promotion to honour our 150th birthday celebration. It was such a great contest and well received by our new consultants that Watkins is putting it on again for ALL of 2019!!!!! Great Sales on Some Tasty Extracts!!! We have some wonderful yummy tasty extracts and to make it even better - this month they are on sale! Look under Monthly Specials above to see these and more! J.R Watkins Extracts - nothing else compares! Looking for Creative, Motivated, Inspired Individuals! Is this you? Are you a self-starter and motivated to redesign your future? Perhaps you are looking for some extra income or you are trying to get better work/life balance? Maybe you see a future where you call the shots and have as much vacation time as you want? In any event, a J.R Watkins home business is very rewarding and flexible, so it will work with your schedule! $29.95 to join - no autoshipments or quotas and a variety of ways to run the business! Plus, join with me as your sponsor and you will have access to our online directory where local customers can find you plus access to our training page full of free gaphics you can use that I have created just for our team! 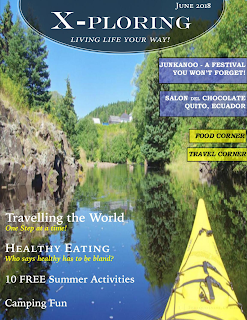 Check out my June X-ploring Magazine: Full of Travel and Food! As consultants we can run our businesses pretty much any way we want. For me, this means I have time to work on new marketing methods and along the way I often find new interests and paths to follow. Recently I got the idea to put together a magazine. I love travel. I love food. I'm not alone! So X-ploring is all about that...Food & Travel! You can find a copy published on Issuu.com and soon, I will have copies on my website once I get it done! This magazine is my own publication and not affliciated with Watkins in any way. The opinion and statements are my own. I am sharing these ideas, recipes, travels with all those who may find them of interest and I always welcome feedback! 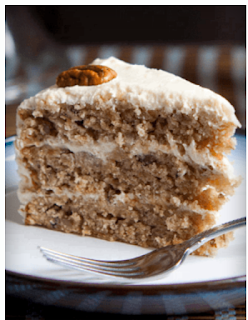 This is a great recipe including traditional aspects of banana bread and twist of new! Watkins has long been known for it's DEET insect repellent and recommended by many professionals for travellers to countries where mosquito-borne illnesses preside. Now offering a new DEET alternative, Watkins gives you Icaridin which gives longer-lasting 12 hour protection and is safe for children over 6 months of age! Why not get a 2-in-1 Suncreen and Bug Repellent Formula? Sunscreen needs to be applied more often than bug repellent. If you are applying sunscreen every 2 hours and bug repellents should only be applied every 4 hours you are either not applying enough sunscreen or applying to much insect repellent following that schedule. Stick with seperate products and be fully protected while enjoying the outdoors! FREE Vacation? Yes Please! See How J.R Watkins Can Get You There! Wanting a nice tropical get away? How about a FREE one?! That's right...J.R Watkins not only has a great compensation plan with great benefits, free shipping offers, bonuses and more...it also offers a program that rewards consultants a Trip for 1 or 2 to an all-inclusive destination, air fare inluded! How sweet is that? 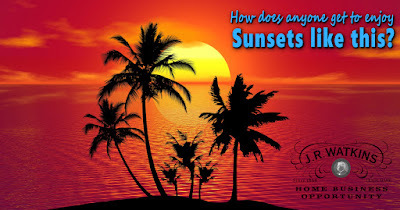 Imagine 6 days and 5 nights in a tropical paradise, free to relax and unwind and spend time with other consultants and executives or just chill out on your own. No pressure to do anything, just relax - you earned it! Learn more about the J.R Watkins Free Trip and where it is this year - join as a consultant and start earning your points to this trip today! Hi! I have been with Watkins for over 10 years now and this is what I do (and Love!) I'm an Indep. Consultant currently at the Manager level and my team is across Canada and the USA. I work with those who want help and am never pushy or demanding! This is YOUR business and you set the pace! If you want help - great! I'm here. If you want to do it on your own time, that's fine too - I'm here whenever you need help! Since joining Watkins I was recently told by Watkins I have personally sponsored over 1000 new consultants. Not a typo...that is one thousand! I was quite surprised too! I have had the chance to make many friends and share in their lives over the last decade, helping many of them reach their goals and be happy to see them where they are now! I believe in sharing information so I share with my team what I have found to work and not work! I am always looking for new marketing trends and testing out new techniques and then sharing the results plus doing tutorials and I'm happy to help you too! You can learn more about this business, perks and watch a quick video at my informational website at http://www.WhyNotNorthAmerica.com. I'm here to answer any questions - any time! Start a J.R Watkins Home Business - No Autoshipments or Quotas! Starting YOUR J.R Watkins Home Business! 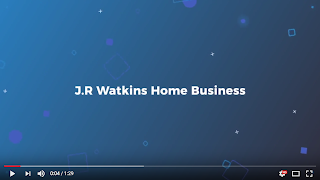 If you have been wanting to start your own business part time or full time - J.R Watkins is the perfect home business for you! With it's flexibility, great compensation plan, trusted reputation for 150 years and exceptional quality products - you can work this business when you want, how you want! In business since 1868 J.R Watkins celebrates 150 years of trusted service this year! 150 years of going strong and offering top quality products to families across Canada and the USA for generations! The business relies on Independent J.R Watkins consultants to help get the products to customers across North America. People like you who are motivated and want to work either part time or full time. It is a flexible business, designed to work with your schedule. Offering great compensation and benefits and even free vacations annually for those who qualify with our Performance Rewards Program! It's pretty easy and all you need is a Watkins sponsor. Since you are here, on my site you already found one! My name is Tamara Laschinsky and I've been an Indep. Consultant for over 10 years now. I'm a National Team Manager and my main focus is this business! I work with consultants on my team to help them reach their goals - whether it's some part time income or wanting enough to build a stable retirement plan! Ability to build a business with a company based on Integrity and Trusted for 150 years! Ready to get started? Go to www.RespectedHomeBusiness.com/378193 to begin (this is the same type of site you will get for recruiting by the way!) Questions? Feel free to ask, I'm happy to help! Want to join now? Go to our Training site at www.RespectedHomeBusiness.com/378193 to begin the signup process! What are YOU Waiting For? Join J.R Watkins Home Business Today! Have you been thinking about starting your own business? Perhaps you want to add some income to your household or get ready for retirement? Maybe you are retired and are looking for something to do? Or maybe you just want to get the discount for yourself on the products you love! A J.R Watkins business is fleixible, more so than other companies out there. With only $30 for the membership fee, no autoshipments or other comittments...this is one business you can work at your own pace and not have to worry about having to 'sell this' or 'buy that' in order to reach 'quotas'. We don't believe in quotoas. This is YOUR business, run it as you see fit (within guidelines of course! Must be professional while conducting business right!) This is your chance to run a business the right way, to havce a say in how customers are handled and to build a solid reputation in your business community! So get started today! Click on Sign In/Create Account at the top of the page and sign up as a consultant today! If you have any questions, feel free to ask! I've been doing this over 10 years now and am thankful for the day I decided to start my own home business. I'm here to help you on your path while you begin your journey! When you start your J.R Watkins home business in August 2017 you will get a FREE $30 Watkins gift certificate! With membership fees at $29.95 and no autoshipments, this is the perfect time to get started - plus we are going into our busiest time of the year! You get upfront discounts on qualifying orders, free S&H on qualifying orders and there are many bonuses in the system that equate to $8,250 USD with great additional bonuses at the higher levels. We don’t have any auto shipments or commitments...you don’t go inactive if you don't sell for one month or two etc. Watkins is very flexible and designed to work with your schedule. You can do direct selling to customers, do trade shows or set up a booth, do home parties or focus on online advertising or sponsoring or a combination of those methods, whatever works for you. Your Retirement: Do You Have Enough Money? It's a scary thought. Many of us begin working and don't give it much thought. Then, we think about retirement and can't wait to relax and not have to get up and work 8 - 14 hour days...but then reality clicks in..."Do we have enough money to retire?" Most of us do not. Starting RRSP's to late in life we realize to late that not only will we not be able to retire early but we won't have the income to give us the comfortable retirement we were hoping for. However, you can still do something about it! A J.R Watkins home business is a perfect example of how you can build a business up making income now to pay off debt, mortgages, bills etc. while building a team and growing your business to provide you stable income in your retirement years. You can also use the extra income from your J.R Watkins home business to put more money into RRSPs as a buffer. When the time comes to retire, instead of taking money OUT of your retirement fund, you can leave it alone and let it grow and live instead on your income from your J.R Watkins business! If you are wondering at this point, just "HOW MUCH MONEY CAN a J.R WATKINS BUSINESS give me? "...well I am not allowed to state claims on income as everyone is different based on what types of selling, marketing etc they do and how hard they work at it. If you think you can just join and sit back and wait for it to happen, I can tell you honestly that your business will likely not grow as you hoped! However, if you work at your business and treat it like a business you will see it grow. With growth comes more money and a stable business. Imagine making $4,000/month from your home business. That's $ 48,000/ year. If your bills, debts, mortgage etc were all paid off, could you live on $4,000 a month? I would think so. Imagine $5,000/month or $8,000 or more....the power rests with you and how you start your business and work it. Now, you may say "I want to retire...not work!" Sure, not a problem. Start the business now, build it. As it generates your income and you build your team you will be paid on team sales and not need to do as many direct sales. Plus, like other top leaders who are 'retired' you can hire someone to do your day-to-day admin tasks, freeing you up to relax and travel! Win Free Vacations with a Watkins Business! Tried and tested products with a strong history since 1868, JR Watkins not only has great products and a great business model, they also reward consultants who qualify with a free vacation each year! Known as the Performance Rewards Points (PRP) Program, consultants must meet a few requirements over the course of the year and if they qualify, they can earn a trip for 1 or 2 to all inclusive destinations inclusing airfare. 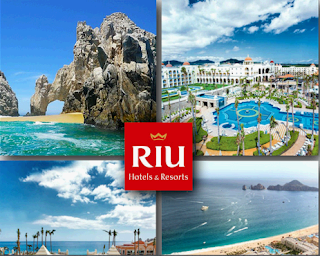 Past destinations included Ireland, Spain, Hawaii, Mexico, St. Maarten and many more! With tons of fun to do and the opportunity to meet other leaders and consultants, the trip is a chance to realx and enjoy yourself. Unlike other business trips, there are no 'agendas' or business meetings you must attend. Your time is your time. Go on excursions, do some sight-seeing, spend time alone or with the group - it's totally up to you! If you don't like to travel, that's fine - you can take away a cash bonus instead of $250 or$500. Last year's earners (2016) went to Cabo San Lucas this past April. Check out the video to see photos from the trip! J.R Watkins Spices Ready to Order! J.R Watkins Spices Ready to Order Canada & USA! You've been waiting and the wait is over! You can now order the popular spices in Canada and the USA. Most are ready for order now, some more will be introduced soon. The spices will come in the larger size and priced at a great low price. Get the quality you expect from Watkins and the prices you love! Order your J.R Watkins Spices now by going to Gourmet above! Don't forget to check what's on sale this month too by looking at the Special Offers tab! Regular membership is just $29.95 and you have no auto-shipments or monthly min orders to stay active. This is a flexible business designed to work with your schedule. Free e-consultant site so customers can order from you, free business prospecting site to build a team if you wish. Plus enjoy access to our regular training site, Timeless Integrity where you will find many articles, past webinars and videos from top leaders and tips on how they have succeeded. Join our monthly webinar if you have time or watch it later. Members of Tamara Laschinsky's team also get a free listing on our team website so local customers can find you. You also are welcome to join the Advanced Training Group (free) where I post various topics and other members of our team are also there to share advice, ask questions and learn from one another! Click here to join Watkins today or feel free to contact me with any questions you have! Offered ONLY to members of my team. I am holding a contest that is available to all members current and new, for the month of February! Details are on my Advanced Training Program (a free program my team is welcome to join, it is on Google). It is here you can comment to enter and then begin to work on the qualifications until the end of the month. Training with Timeless Integrity with many articles, webinars and incentives like gift certificate giveaways, contests and more! Free S&H on orders over $100, no auto shipments and total flexibility. No pressure. Sell how you want, when you want. A Watkins home business is designed to work with your schedule. Are you ready to get your Watkins Home Business started? Committment - Are they dedicated to what they do and willing to help you reach your goals and work with you. Yes - we have our training site - Timeless Integrity, but you will also want some 1 on 1 help if you are serious about your business. This is where you sponsor comes in, are they going to be there for you and willing to work with you. Do they do this casually, part-time or is this their full-time gig? All questions you need to ask when checking out who the best fit is for your sponsor. Knowledge - How long have they been with the business and how involved are they. Even if they are new that is totally fine. We all start somewhere. Do they have a strong upline and do they seem willing to get answers and do they appear to already know quite a bit. Some sponsors like to just defer their downline to their upline without even wanting to know what those answers were..you want someone who is intersted and involved because that is someone who wants to also be successful! Successful - Are they successful? Success is defined by many methods, not just money alone. How are they doing in the business, have they met their goals, what are their goals. Perhaps it was to stay at home with their family or earn some p/t income. Or maybe they are retired and wanted a hobby. Have they received some achievement rewards and recognitions from Watkins for performance since they joined? Have they learned new skills since becoming an entrepreneur? These are all successes! A successful person will understand this and recognize it and be able to answer this question for you if you ask them if they have been successful with the business and how! What can I offer you? I've been with Watkins at this point for almost 10 years. In the beginning, I was only in it part-time, more as a hobby really. But then I saw potential and I decided to give it a go. I started building some websites and doing some advertising. I created a website to help my team advertise locally. It's a free listing for all my team members and their downline and a committment I make to my team to help them grow their business. I later created the Advanced Training Program, a place where I write about business tips and ideas as well as encourage members to share their success stories and ask questions. I work with my team one on one to help those who want the help to reach their goals and advance to Manager and above because it's not that hard and the rewards are wonderful! The work/life balance and freedom plus the ability to earn the free trip each year which I've been fortunate to go on a few trips so far, motivates me to help others do the same. This business is more 'business coaching' for me now and I work full time at it. Not because I have to, but because I want to. I spent my extra time coming up with ways to help with advertising and articles to write in our Advanced Training Program. A Watkins business is flexilble and easy with no autoshipments or crazy business. You work at your own pace with many methods available to fit your shedule. To begin today, click on the link above and get started! I'll be in touch within a day or so after your enrolment processes but you can contact me anytime with questions! Only the finest extracts with pure and quality ingredients. No GMO ingredients here. Our Pure and Natural extracts are top quality and will give you the finest flavor and quality you have come to trust and love in the J.R Watkin name! Choose from a great variety and use them in your baking, cooking, drinks and smoothies! Last year the candles sold out in 10 days! We have the limited quantity items in stock right now in 2 great scents: Fresh Ginger and Vanilla Mint! They aren't shown on the tabs yet but you can find them using the product codes below and enter them in the search box above! Get a discount! Join as a J.R Watkins consultant! Simply click on Sign In/Create Account in top right corner and then choose to join as a consultant (make sure you have choosen the flag of your country before clicking on Sign in). Be sure you have me as your sponsor (ID#378193) and this way, you will get the November special which is a free $20 GIFT CERTIFICATE (emailed to you about 2 weeks after you join!) This offer is through my upline, not through Watkins. Fill out the form, get your ID# and password and go shopping with your new ID# and discount. Discount will show up once you go to checkout. Premium natural ingredients in this incredible formula will leave your hardworking hands smooth and smelling fresh and clean! See why our customers give it a 5-stay rating and best of all, it's on sale this month! J.R Watkins Products: Toilet Bowl Cleaner - Best Selling Product! When you say Best Toilet Bowl Cleaner ever - you think J.R Watkins! Seriously! If you have hard water problems and water with high rust content that lead to embarrassing stains that will not come out, you NEED this product! If you think your toilet bowl will never again be white and clean think again. Watkins is well known for this toilet bowl cleanser and our customers stand behind it 100 as does the company! It cleans, it deodorizes, it's safe for your septic tank and a great disinfectant! It is very powerful and should be used on vitreous china only. Have you tried the J.R Watkins Pure Ground Black Pepper? We are talking quality and taste like you have never had before! Even if you are not a major connissouer of pepper, you are going to be pleasantly pleased with the amazing flavor this pepper will add to your favorite dish! See the difference Watkins pepper adds to your food and you will understand why so many customers won't settle for anything less! Available in both USA and Canada. By far one of Watkins' most popular and sought after products! Well recognized by many generations, this camphor medicated rub has been used in families in many household to treat many congested lungs and ease stuffiness. Rub some chest and throat and on your feet and cover with socks for good night's sleep. Did you also know this ointment is also great to help with temporary relief of pain associated with arthritis and rheumatic illness and backaches, sprains and strains, lumbago and bruises? Truly and must-have for your medicine cabinet! Hydrate your body and awaken your senses with this amazing body body and combination of lavender and roman chamomile! Shea and cocoa butters are mixed to give you long-lasting hydration and anti-oxidant rich plant oils will protect your skin. Become a Watkins Consultant in Your Area Today! Concentrated skin nourishment for natural softness and feeling for your skin! Apply to damp skin after cleansing. Containing cold-pressed grapeseed oil rich in Vitamin E which is a natural antioxidant and helps protect and nourish all types of skin. It also contains cold-pressed Blackberry seed oil, rich in Vitamin C, another rich antioxidant. Follow me on Google + Become a Consultant Today! 1868 - The very first product produced and offered by J.R Watkins! This natural pain relieving product has been updated to remove all traces of artificial red coloring. Fast absorbing and containing all natural camphor and red pepper extract to stimulate nerve receptors. Great to relieve minor muscle aches, soreness and stiffness. * Red Pepper Extract makes this a hot formula - pat, don't rub! Keep your skin soft and clean with this great on the go travel kit! Also makes a great gift idea! Start A Retirement Investment Today With J.R Watkins! Thinking of starting a business? Consider joining Watkins and starting a business with almost 150 years of business under it's belt! Integrity and loyalty, J.R Watkins is well known across North America and is a name customers have come to know and trust! Not only do they have a good compensation plan and good quality products at reasonable prices, you also have perks like the Performance Rewards Program where you can earn a trip for one or two each year! Learn more at my informational website at http://www.WhyNotNorthAmerica.com and if you have any questions feel free to ask! I've been doing this almost 10 years now and it's the best decision I ever made. Not a day goes by I don't give thanks to my mother for suggesting I choose this as my part-time job while on maternity leave...I never realized it would become my retirement investment! Getting Reading for Thanksgiving next month? I know it's a month away but believe me...some items sell out quickly! Besides, this is a great item to have on hand all year round if you love Pumpkin Spice! Sure you can use it for your Pumpkin Pie or Pumpkin Cake or Pumpkin Cheesecake...but think outside the box...Pumpkin latte..pumpkin tea...deelicious! This month all extracts are 10% off! Finest cassia cinnamon has been well known to Watkins and our customers for over 100 years! High-oil Korintje cassia has the best quality and finest flavor you will ever taste with double the flavor of the common Ceylon varieties. Great on cereal, yogurt, in tea and other beverages, in smooties, on pancakes and french toasts, in baking and cooking, on toast...the list goes on! There are also medicinal claims ranging from antioxidant effects, anti-inflammatory benefits, diabetes benefits, balancing blood sugar levels and aiding digestion, to name a few. History had already made claims of practitioners using cinnamon to treat ailments of sore throats and infections and other dis-ease. Did you grow up with that 'GREEN TIN' in your medicine cabinet? Or did you see it often at your Grandmother's house? I grew up with it and when you had a cold...it was your Go-To all the time! It was one of the main things I knew Watkins for, the Medicated ointment. I've also learned from other customers that it's great for soothing skin and the best application I've heard so far, because I know it affects so many people is it can help your arthritis inflammation! So check it out this month, look under Monthly Specials and get it at a special sale price! Stock up because you know this is one product that never goes out of style! I can't remember my first experience with Watkins Cinnamon, but I can say I can't ever remember not having it in our pantry! There are some things in life you just grow up with, Cinnamon from Watkins was one of those things for me. I never realized how good it really was until I tried something different. Night and Day! Watkins Cinnamon is so sweet and smooth, it just has that taste that compliments everything and is not overpoweirng. I can use it to replace sugar in instances like my oatmeal! It brings such flavor to the dish and best of all, it's good for you! Needless to say, my love for one spice prompted me to try others and Watkins does not fail to satisfy! I understand now why so many customers will travel miles to find a consultant or why customers will come up to my table and buy dozens of cans in one shot! It's something you just don't want to run out of - ever! 10 years ago I was looking for a home business to start. I was on materntity leave and wanted to do something on the side. Partly for money but mostly for something to do. I joined Watkins after my mother told me her and her friends no longer had a consultant in their area. So I joined up and did a few sales. Nothing major and I loved the Watkins was flexible. I was under no pressure to produce sales, no auto shipments, no silly business. It worked very well with my schedule! Then, about 9 months later, I started to get more serious with the business. I began to put some effort in and work it more. I great my customer base and began building a team. Eventually I decided to focus more on building a team and then helping my consultants to build their businesses. It took time and effort but it paid off! Like any business what you put in you get back out and I am so happy to say that I now work at home F/T and can honestly say starting a Watkins business was one of the best decisions I ever made! I have a stable business and steady income the has survived recent economic downturns. The business has sent me on trips I have earned through the Performance Rewards Program. Being a consultant has allowed me to create a great work/life balance at home and I create my own hours and vacation time which works out great for taking vacations with the family. Plus, it's a great retirement plan. Though I still have some years to go...I know that while others will be collecting pension as they retire and living on a fixed budget...I will be earning income and that number only increases with each year I work with this business. I am truly thankful for my mom for suggesting getting started with this business. It has changed my life in the best way possible! If you are looking to get started, take the tour at our training website http://www.RespectedHomeBusiness.com/378193 and see if a J.R Watkins Home Business is right for you! Canada - Watkins Bug Spray and Lotion on Sale Now! Such a popular product, well it's back and in full stock so get yours now! A couple years ago Watkins totally ran out of the supply and while they make every effort to keep it in stock, sometimes demand is HUGE! Especially with the fear of the Zika virus and people who are travelling to warmer climates. So stock up on your Watkins insect spray and lotion, there are different concentrations of DEET including one for children. Please remember to use it sparingly and when possible, wear long pants and sleeves as your first defence (spraying the product on top of the clothing!) DEET is extremley effective. There are many things to consider when starting a home business and I am happy to help you with your questions. I've been an Indep. J.R Watkins consultant for almost 10 years now and I'm happy to say it's successful and I love what I do! I manage a team of over 300 consultants who are from Canada and the USA and my business has been growing year after year. The J.R Watkins business was the right choice for me and fit my lifestyle nicely. I plan on it being my retirement package. 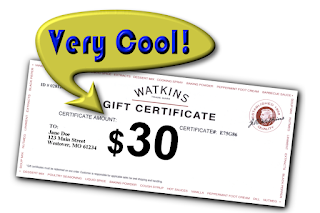 Join Watkins Business in August 2015: Free $20 Gift Certificate! 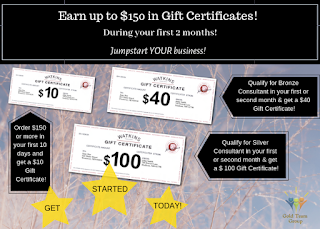 New Consultants who join the Watkins business in August 2015 will recieve a free $20 J.R Watkins gift certificate! So if you have been thinking of starting your own Watkins home business...now is a great time! Among many perks, you also have access to fun photos like this one to help you share the business and generate sales and inform others of the business! What else do you get? Access to our training site and one on one support with your sponsor and their upline. If you join my team you get a free listing on our team website GoGreenNorthAmerica.ca where local customers can find you! You get the free $20 Gift Certificate if you join this month plus I also often do my own contests, like the one I've been running lately - offering another $20 Gift Certificate to those on my team who have sales of $500 or more each month. The signup fee is only $19.95...reduced from the normal $39.95 for this year. And best of of all - no quotas or hidden fees. It's very flexible, meant to work with you and your schedule! Learn more at http://www.RespectedHomeBusiness.com/378193 or email me at Info@GoGreenNorthAmerica.ca for more information! My team has been asking for quite some time about 'starter' kits. Watkins used to have some kits awhile back ( like the Watkinize Your Home Kit) but discontinued them due to issues with keeping items in stock to fulfill the orders at times. So to avoid disappointment they decided not to do the starter kits anymore. It's taken me some time, but I've worked on creating some starter kits that are based on the type of venue you wish to do and to fit your budget. They are not set in stone, they are suggestions and you can totally modify them however you want! These PDF documents show the item # for quick ordering as well as the regular product price, your price, your savings and what the entire order cost will be to you. It also calculates the # of products so you have a good idea of how many items you'll have to display at your venue! Looking for a low-investment business you can start that is flexible, has no minimum quotas or monthly requirement costs? You've found it! JR Watkins has been around since 1868, surviving depressions and recessions and never failing to keep their customers and consultants happy! The choice is yours! Join with me today and you will get access to Timeless Integrity (free membership), a free listing on our national team website GoGreenNorthAmerica.ca ranked in the top #3 searches when customers are looking for local reps and as much coaching as you want from myself and our whole upline! I've been with Watkins since 2007 and it has been one of the best decisions I've ever made! I started slow, more like a hobby and eventually grew my business nationally, meeting so many people along the way and earning so many things, like Performance rewards points along with great bonuses and even being eligible for the annual trips! 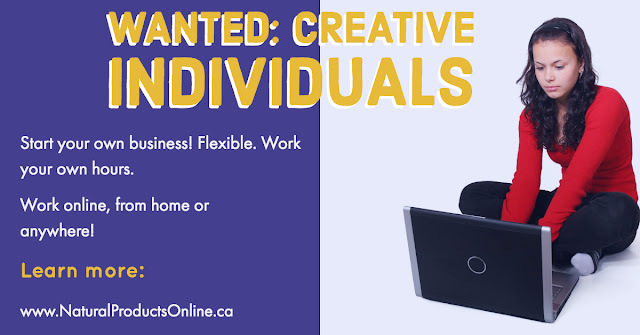 If you have any questions, feel free to ask: info@NaturalProductsOnline.ca or begin the signup process at http://www.RespectedHomeBusiness.com/378193 Look forward to having you on our team! Are you looking for a Watkins Sales Catalouge? You can download one from my website at NaturalProductsOnline.ca. Scroll down the page once there and you will see the sales flyer for Canada and one for the USA. Click on the image to download the PDF catalogue. It should open in a new window and uses Adobe to open the PDF. To see the sales prices online you must be signed into your account. When you go to order, remember to sign in with your account ID# so you can track your order. If you don't have an account ID#, set one up by clicking on Sign In/Create Account (top of page) or by telling customer service you'd like to set one up if you are phoning your order in. If you are phoning your order in you can let customer service know that consultant #378193 referred you. Did you know you can make your own maple flavored syrup with Watkins Maple Extract? Follow this recipe for a yummy syrup great on pancakes, ice cream and other sweet dishes! Bring water to a boil in saucepan and add sugar. Cook and stir over medium heat until sugar disolves. Remove from heat and add in extract. Serve warm. Makes 2 cups of syrup! You can use the extract in baking as well for the good ol' Maple flavor! Enjoy! I hope everyone is having a wonderful and festive July 4th weekend and enjoying some good times with friends and family. In Canada here we just celebrated our July 1st long weekend and the weather co-operated which made for some great times! 4. Bug spray - apply as needed. Pesky mosquitos don't make for fun, nor does scratching at the bites later! Try Watkins bite balm to relieve itching or the good ol' Petro Carbo Tin. You can also use Lemon lotion or peppermint as mosquitoes really don't like lemon or peppermint scent! It's just been announced! 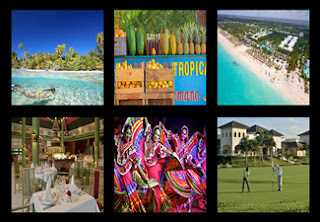 This years getaway vacation is set to go to the tropical isle of St. Martin in the Carribean! 4 nights lodging, this beautiful destinaation is one to strive for! This is all part of the Watkins Performance Rewards Program (Like an AirMiles or Aeroplan) where Watkins consultants earn points each month and can redeem for items like electronics, kitchenware and travel! The program is just one of many perks to being a Watkins consultant so sign up today and get started! With all the new products coming on board, the busy summer season here and the super busy holiday season fast approaching - this is a great time to get going! With the new website getting fixed up and new products coming on board, there is even greater news! Coming soon, in August of this year, Watkins will ship Canadian products from Canada from a Calgary distribution center. Now is the time to get set up and established as a consultant in your area. The new products and fast ship times are going to help you get a fast start to launching your business. Consultants will soon be able to sign up online again so watch for that new feature. If you want to know more about the business or the upcoming features, just email me at info@NaturalProductsOnline.ca or phone 403.998.8597. My business is in helping you run your business. I want you to succeed and have that life that you've always wanted. Years ago I dreamed of having real work life balance and now that I do, and I know it's possible, I want to help as many people as I can in doing the same. Don't kid yourself - Watkins is a real business and it will take work from you to get it going. This is not some easy-get rich quick scheme (that's called a lottery ticket if you are so lucky to be a winner!). But you can succeed with a Watkins business and so much work has been done for you, it's a great investment for your future. No matter what phase you are in your life right now, you can start up a businesss with JR Watkins to plan for your future. It's easy as 1-2-3! The whole business model is designed to suit various lifestyles so whether you are working full-time, working part-time, a stay at home parent or even already retired, you can start your own Watkins business and run it however works best for you! No quotas to fill, no comitmments - and best of all, you are representing a company that's been around 150 years and is well known for trusted customer service! Step 2: Order any product(s) or assortments that you may want to get. If you don't want anything yet, no worries, just get the basic membership ($29.95) and you are good to go. Step 3: You are now a Watkins consultant and can start your business anytime. Order for yourself, for friends or begin growing your business - you decide. No matter your decision, I am here every step of the way and will be here to help you anytime! So call them now and start your JR Watkins Business today! Absolutley tasty and versatile you can add this to sour cream for a great veggie or chip dip or even into some cream cheese for a spread! This dip mix is one of the favorites that my family and friends come to expect when they come over for dinner! If I don't have some out on the counter for everyone to snack on they are wondering if I forgot to make it! Buy yours today and don't forget to stock up - not only will you need more - you can likely sell a couple of jars too! Did you grow up with Watkins in your pantry or medicine cabinet like I did? Or did you just recentl come across one of their lines through a referral from a friend? JR Watkins Contest - 1 of 5 Gift Certificates to Give Away! Email your favorite products/recipe to me at Info@NaturalProductsOnline.ca and you will be entered to win 1 of 5 Gift Certificates for JR Watkins products! Contest closes June 28th, 2013. Watkins Soup bases are back in stock! Use the search feature or look under the kitchen section to find the soup bases you have been waiting for! Now re-formulated, it's still a great taste and quality you've come to love with Watkins! When you think of Cinnamon you like think of apple pies, ice cream and other yummy desserts. Did you know that Cinnamon is really healthy for you and is used as a treatment in many home remedies? Cinnamon comes from the bark of a tree found in South Asia and the Middle East. You can either buy the cinnamon in sticks or ground up as a powder. There are two varieities: Ceylon and Cassia. Cinnamon is high in anti-oxidants and the cinnamon oil is anti-bacterial and anti-fungal. It is also high in manganese, fiber, calcium and iron! While you can order JR Watkins products online and have them shipped to your door, I know that it's sometimes nice having a Watkins consultant in your local area to order from to. That's why I created the website GoGreenNorthAmerica.ca. This website lists local Waktins consultants in your area! When you go to GoGreenNorthAmerica.ca you can search by Country (Canada or USA) and then by Province or State. There you will see all the consultants on my team, listed alphabetically. Some will have their contact information listed (phone #, email, website etc) and others may have a private listing. Those with private listings have chosen to not display their contact information the internet and instead, when you click on the contact link, it comes to me. From there I will pass along your information to that consultant. 1. You can look around at local markets in your area. Often there are Watkins consultants who set up tables to sell products. 2. You can order online directly at Watkins from this website or by phoning 1.800.928.5467. (You can give consultant ID#378193 as reference). If you have ever tried Watkins Cinnamon and Pepper you know there is no going back! Nothing compares to the wonderful flavor both of these spices offer! For more than 100 years, Watkins cinnamon has been a staple in households across North America. It's a high-oil Korintje cassia variety that has doulbe the flavor of the regular Ceylon varieties! Watkins cinnamon offers 3 to 3.5% of the essential oil of Korintje cassia whereas many others on the market offer 1-2% and even as low as .5%! Take a taste and see why Watkins customers prefer Watkins cinnamon! Ask anyone who knows and loves their pepper - there is nothing like Watkins pepper! Made from the finest peppercorns from Malabar and Lampong, Watkins chooses to chip each berry (versus crushing) to ensure the high essential oil is still present, giving you the most flavor possible! You can also purchase Watkins pepper in our special 'grinders' that allow you to grind as needed! 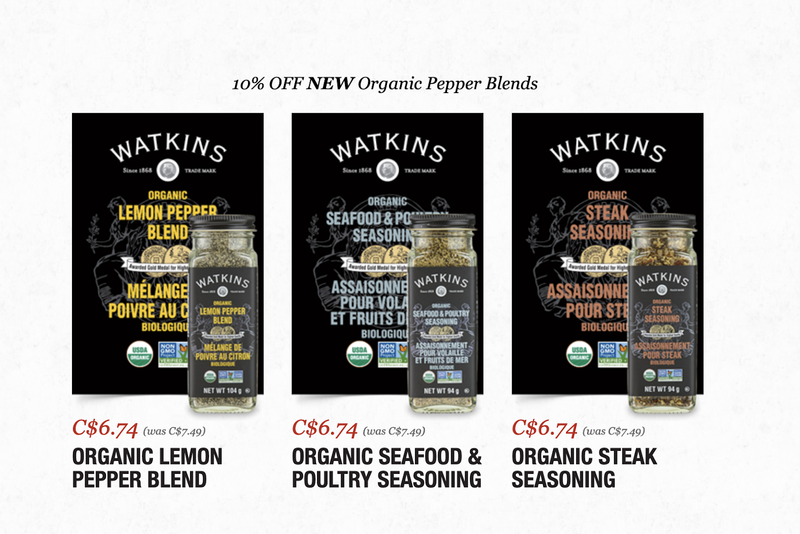 Click on the "SEARCH" button on the top right of the page and type in 'Pepper' to see the options for Watkins pepper!